I love your work even if this is probably the most OP mod in existence. The only way to nerf it I can see is to slow things down, however I was thinking of some updates for EnderIO 1.12.. because you know.. OP. 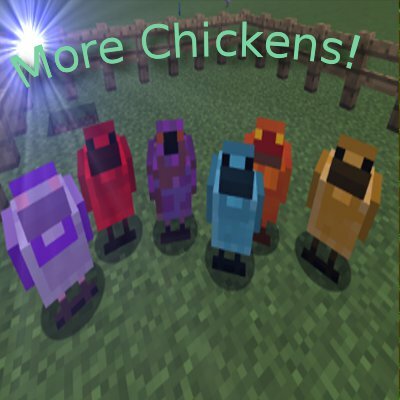 Maybe adding an ender eye chicken as well? for EnderStorage and well.. life. Guess that applies to the End Stone & Chorus recipes also tho. I would move Platinum out of base metals into TE tho.. I've not seen another mod make use of it. Any plan for Thaumium chicken? Alchemical brass is covered by base metals brass. Or maybe instructions on how to add a custom chicken that drops it? Custom chicken's aren't possible atm, but it is something I am working on. As mods are constantly changing. And I dont always have the time to add in new chickens. No worries, was just curious. Have just been editing chickens lay items atm in configs. Probably OP for some aspects like TC. Is it possible to change chicken names in the config file or does that break model pulling? can you add support for Biomes o' Plenty? Please add EnderIO new Ender Alloy (its recipe in EnderIO is Darksteel + End stone + Obsidian), so it can be Dark Steel chicken + Obsidian chicken. I have refined storage installed but I only see quartz enriched iron chicken show up in my menu, why there are supposed to be more chickens for RS? This may be a stupid idea but, What about adding birch, spruce, dark oak, jungle, and acacia log chickens. (I also noticed when i have biomes o plenty and actually additions it added chickens, so what is the FULL list of mods that work with this one? i'm not sure if people say this a lot or not but thank you for the hard work done to make this. I appreciate it, thank you. Hopefully I can get back to making some regular updates. Ive been a little busy this end of year. Is there any hope to add AE2:Certus Crystal? Atm I couldn't tell ya. Too much going right now. Can you make: one stack Solid Experience -> Shift+RMB -> this stack will be used at once? It will be very useful. I'm hoping You will update with all the new materials for Ender IO and Ender IO Endergy. Also I have 2 suggestions for chickens, a flower chicken that would lay a flower ball/egg that could be thrown or right clicked to get a random flower because some mods require specific flowers for some recipes (sunflowers in particular but others also) and also could you make a nether star chicken? Like it could be like the chicken lays a nether star fragment and you craft 9 together to get a nether star shard and 4 shards around a blaze powder could create a nether star. also for the ender io endergy materials i suggest making a chorus chicken that is bred from the ender pearl chicken and the log chicken and you could make the end steel chicken be ender pearl bred with dark steel. also could you make a dragons breath chicken that is made by right clicking it with dragons breath and the nether star chicken could be made the same way but maybe for the nether star one you would have to use a nether star on like an XP chicken. Also could you add chickens for the reliquary mod items?